Ubuntu is a community developed operating system that is perfect for laptops, desktops and servers. Whether you use it at home, at school or at work Ubuntu contains all the applications you'll ever need, from word processing and email applications, to web server software and programming tools. Ubuntu is and always will be free of charge. You do not pay any licensing fees. 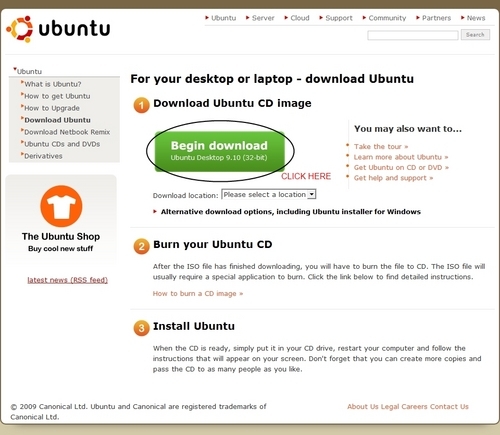 You can download, use and share Ubuntu with your friends, family, school or business for absolutely nothing. We issue a new desktop and server release every six months. That means you'll always have the latest and greatest applications that the open source world has to offer. Ubuntu is designed with security in mind. You get free security updates for at least 18 months on the desktop and server. With the Long Term Support (LTS) version you get three years support on the desktop, and five years on the server. There is no extra fee for the LTS version, we make our very best work available to everyone on the same free terms. Upgrades to new versions of Ubuntu are and always will be free of charge. Everything you need comes on one CD, providing a complete working environment. Additional software is available online. The graphical installer enables you to get up and running quickly and easily. A standard installation should take less than 25 minutes. Once installed your system is immediately ready-to-use. On the desktop you have a full set of productivity, internet, drawing and graphics applications, and games. On the server you get just what you need to get up and running and nothing you don't. The 1st thing we are going to do is go to the Ubuntu Download page and download the image file. Windows 7 includes a small utility called Disc Image Burner. We are going to use this to burn the image to a blank CD. After the CD burns start the Wubi Installer, the Video pretty much sums up the rest.